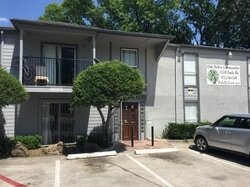 Oak Hollow is an nice apartment community located in North Dallas near LBJ (635) and Central (75) in the heart of the city, minutes from the Galleria, the DART rail station, Bus Routes, TI and only 10 minutes via 75 Central from downtown's Uptown area. Run by a friendly bi-lingual staff with an attentive and prompt 24 hour maintenance crew. Come by or call for a tour, no appointment necessary. We are a Dallas Police Department ﻿Gold Star Property﻿. Our Property Manager was also a director on the board of Dallas CWEB (Crime Watch Executive Board). Oak Hollow is a nice place to live, come join us.